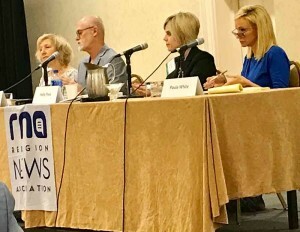 Recently, the Religious News Association (RNA) had a panel discussion with NAR Apostle James Goll, NAR Apostle Paula White and Apologist and Polemicist Holly Pivec. The panel topic was ‘The New Revivalists’. Thanks to the work of Holly Pivec and her well-researched presentation, many reporters now understand that the Presidential Spiritual Advisor, Paula White, is part of the New Apostolic Reformation (NAR).